Our dinner tonight (one of the coldest ever….with temp dropping to -10F) was a delicious comforting Soup to warm the very cockles of our. 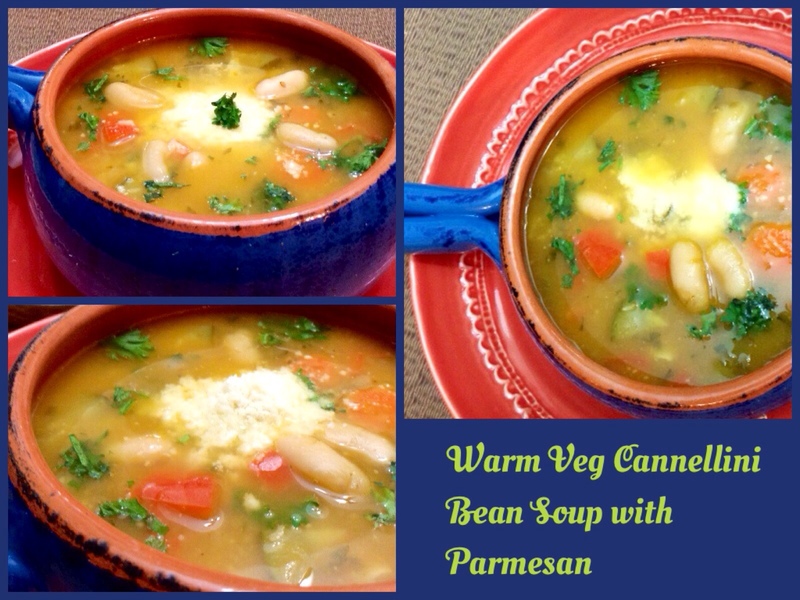 heart…Warm Veg Cannellini Bean Soup with Parmesan cheese! Make a basic thin stock by pressure cooking, blending and straining 4-5 tomatoes and 3 onions with some water. Keep aside. Heat a tbsp of butter, add 2-3 cloves of minced garlic, chopped spring onion, sliced carrot, finely diced bell peppers and zucchini. Cook for 2-3 minutes. Add drained and washed canned cannellini beans, salt, crushed red pepper and Oregano. Cook for another 3-4 minutes. Now add the stock along with 2 tbsp of shredded Parmesan cheese and some freshly chopped parsley. Simmer for 5 minutes, till the soup thickens slightly! Serve warm with crusty bread…garnished with parsley, cheese and some freshly cracked pepper! Green Chilli Pickle Shimla Ishtyle!